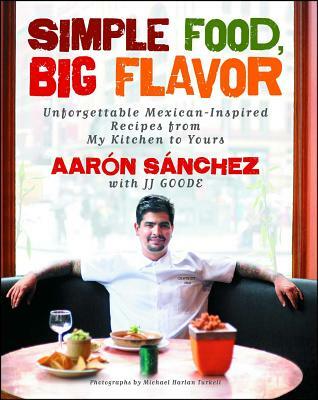 From Aarón Sánchez, chef, restaurateur, co-star of Food Network’s Chopped, and host of Cooking Channel’s Emmy-nominated Taco Trip, comes a fabulous, Mexican-inspired cookbook themed around fifteen unforgettable flavor bases. Aarón Sánchez’s passion, commitment, and creativity have placed him among the world’s leading contemporary chefs. In Simple Food, Big Flavor, he brings us more than seventy-five fun and accessible recipes for home cooks of all skill levels. Rather than overwhelm with complex, intimidating dishes, Sánchez starts small, showing how one simple but amazing “base” recipe—think Roasted Tomato Salsa, Cilantro-Cotija Pesto, and homemade Dulce de Leche—can become many fantastic dishes. Take Garlic-Chipotle Love, a blend of roasted garlic, canned chipotles in adobo, cilantro, and lime zest that keeps in the fridge for weeks or the freezer for months. With this in hand, you’re just a few steps away from mouthwatering dishes like Chipotle-Garlic Mashed Potatoes, Bean and Pumpkin Picadillo, and Mussels with Beer and Chipotle. Sánchez also provides detailed yet easy tips for using each sauce in everyday meals, whether you spread it on hamburgers, turn it into a marinade for easy grilled chicken, or stir in a little oil and lime for salad dressing with a kick. With his warm and engaging style, Sánchez equips home cooks with the skills and knowledge they need to come up with their own simple, flavorful meals every night of the week. Your kitchen will be en fuego! JJ Goode has written about food and travel for The New York Times, The Wall Street Journal,Gourmet, Saveur, Bon Appétit, Food & Wine, Men’s Vogue, Details, and Every Day with Rachael Ray. He has co-authored several cookbooks, including Pok Pok: Food and Stories from the Streets, Homes, and Roadside Restaurants of Thailand with Andy Ricker, A Girl and Her Pig with April Bloomfield, Truly Mexican and Tacos, Tortas, and Tamales with Roberto Santibanez, and Morimoto: The New Art of Japanese Cooking with Masaharu Morimoto. He and his wife live in Brooklyn. Michael Harlan Turkell is a once-aspiring chef and now freelance photographer. Based in Brooklyn, he is the former photo editor of Edible Brooklyn and Edible Manhattan, and documents the working lives of chefs with his award-winning “Back of the House” project. Michael’s work has garnered industry awards and has been published in an array of magazines and books. He also hosts a show on HeritageRadioNetwork.com called “The Food Seen,” which touches on the intersections of food and art.